PennsylvAsia: 2018 Year of the Earth Dog Lunar New Year Celebration, February 17 in Squirrel Hill. 2018 Year of the Earth Dog Lunar New Year Celebration, February 17 in Squirrel Hill. 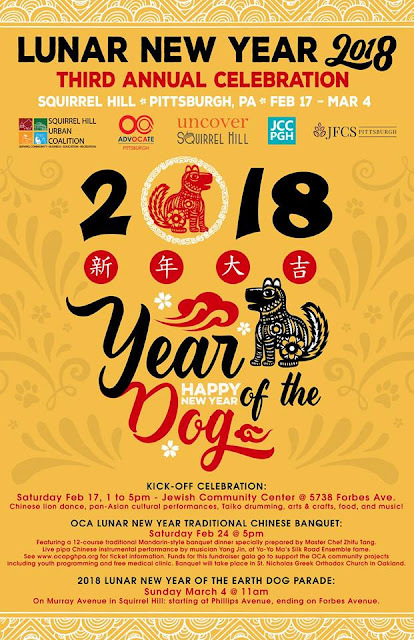 Pittsburgh will begin this year's Lunar New Year festivities with the 2018 Lunar New Year Kick-Off on February 17 at the Jewish Community Center in Squirrel Hill. For the third year in a row, Squirrel Hill is celebrating the 2-week Lunar New Year Festival. Beginning with a kick-off celebration on Saturday, February 17th at the Jewish Community Center and culminating with the Year of the Earth Dog Parade on March 4th on Murray Avenue, be awed by dragons and dancers, taiko drummers and martial artists, and eat in some of the best Asian restaurants in the city! Throughout the building, attendees can enjoy free arts and crafts for the kids including calligraphy, origami, making hand-drums (for the parade of course! ), Chinese paper cutting, and more. There will be door prizes and free give-aways throughout the afternoon, be sure to submit your name! There will also be delicious, authentic Asian foods and drinks, savory and sweet for sale. In addition to the activities inside the JCC, two teams of lion dancers will be visiting and blessing our merchants on Forbes and Murray from 10am to 3pm. On stage in Levinson Hall, we have planned over 21 live performances. The event runs from 1:00 to 5:00 pm in the JCC (map) and is free and open to the public. The annual Lunar New Year Parade will be held in Squirrel Hill on March 4.